On the evening of March 22, 2019 after a four day trial, Officer Michael Rosfeld joined the ranks of acquitted killer cops, as a jury issued a “not guilty” verdict for the shooting of black, unarmed teenager Antwon Rose II. While the jury failed to deliver justice despite unquestionable evidence of murder, the greatest blame falls upon the office of District Attorney Stephen Zappala. The DA’s office put forward an intentionally weak prosecution, underscoring that the deciding factor in this case was not that the deadly use of force against a fleeing child was absolutely unjustified, but rather, what mattered most was what ran through Rosfeld’s mind when he shot Antwon in the back. Instead of offering experts to argue the former point, they offered law enforcement witnesses that supported Rosfeld’s narrative – that he feared for his life – while allowing the defense to demonize the victim. The trial and its outcome are cruel reminders of Pittsburgh’s racist history and corrupt criminal justice system, and echoes the epidemic of racist police violence across the country. Hundreds of activists and young people immediately took to the streets over the weekend, and occupied intersections and businesses, demanding Zappala’s removal from office, the firing of Fraternal Order of Police President Robert Swartzwelder (for obstructing investigations into police shootings), and a county-wide civilian review board. Shock and anger have ignited a fire in Pittsburgh’s youth to take action. On the first day of classes after the verdict, a student-led mass demonstration issued a resounding indictment of the system that let Antwon’s murderer walk free. On Monday morning before noon, students from over twenty schools – ranging middle school to university level – walked out of class and traveled to the Allegheny County Courthouse. Over the weekend, Pittsburgh Public Schools Superintendent Anthony Hamlet had responded to the initial calls for walkouts, declaring the district didn’t support students leaving school to enter an “unpredictable and potentially hazardous scene,” and requiring students to submit parental permission notes to participate. Students immediately rebuffed this as a scare tactic; the move also spread the word about the protest, and further upset students and teachers alike. Where walkouts could not be staged, several schools staged sit-in protests and speak-outs on their own campuses, in solidarity with the downtown demonstration. Students shared these demands and action details through social media and printed leaflets. After they were read at the Courthouse they began to march in the streets as more students continued to arrive from all directions. Eventually more than 1,200 youth participants stretched over four city blocks in the rain, disrupting business-district traffic for three hours. Their chants could be heard 30 stories up in the buildings towering above. Some workers and residents emerged to support from the sidewalks or join the march. The demonstration continued without incident, completely disregarding restrictive “Red” and “Yellow Zone” protest policies, which the city implemented after last summer’s protests following Antwon’s murder: the very protests that pressured Pittsburgh’s political establishment and Zappala to charge Officer Rosfeld in the first place. 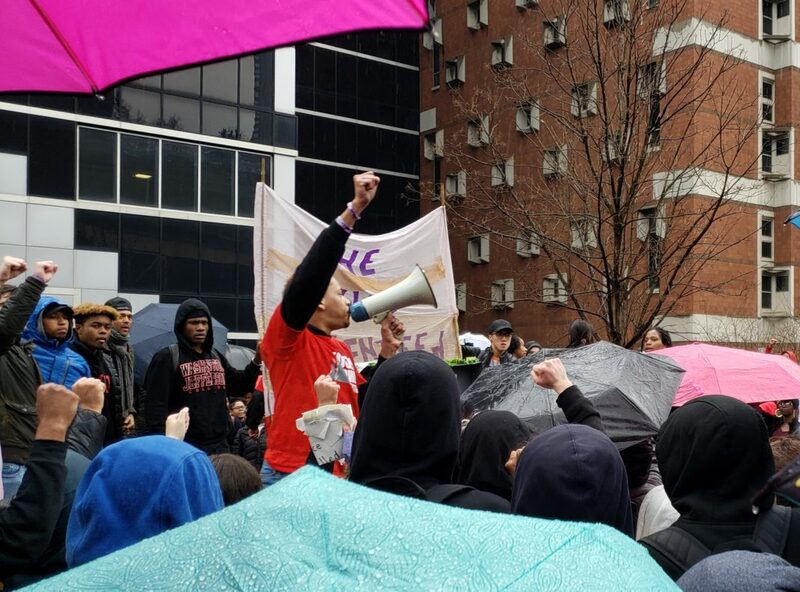 The march stopped at the Allegheny County Jail where, in an incredibly powerful moment of solidarity, hundreds of young people chanted “Black Lives Matter,” and prisoners responded by knocking on windows and switching lights on and off in support. Solly: This system is guilty! Officer Rosfeld’s acquittal came only weeks after Sacramento’s District Attorney announced no criminal charges against two police officers for the brutal murder of Stephon Clark, another young, unarmed black man whose death the law deems justifiable. Such failures of the court system – from its continued defense of the state’s deadly force, to overcharging and disproportionately incarcerating people of color – are integral to maintaining an inherently oppressive capitalist system that routinely punishes and impoverishes black, brown, and working-class communities. Because the courts are only one branch of a state apparatus run and directed by the interests of big business, we can’t rely on them to enact the change we need. Socialist Alternative Pittsburgh supports the 10-point program toward full racial and economic equality that the youth have put forward, which our student members helped to draft. For socialists, this struggle must continue and urge the unions to take up these demands and help organize for future actions which can fully shut down the city. All students and working people must stand shoulder to shoulder in the streets against police brutality and racism, record income inequality, and a planet under existential threat. The world that young people desire and deserve cannot be provided under capitalism. It will take massive, multi-racial movements of working people and anti-racist organizations, much like during the Civil Rights era, to shatter this indefensible economic and political system through continued organizing and protest. In its place, we must strive for a socialist society, free from the hyper-exploitation, cages, and killings that characterize American capitalism’s racist legacy. The struggle for socialism is the struggle for a world in which black and brown communities are no longer deprived of the resources they need to not only survive but thrive, and in which workers of color have real democratic control over their workplaces, schools, housing, and neighborhoods.